If you are reading this in order, no doubt you are squirming in your chair. 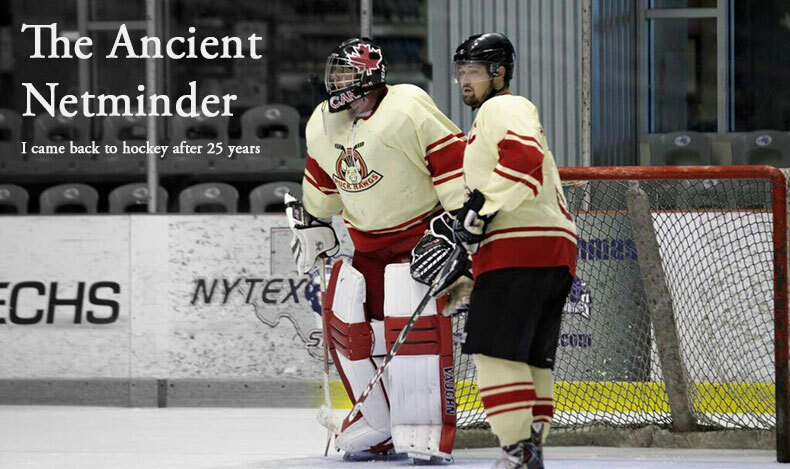 Wondering what happened on my first night back from a 25 year goaltending hiatus. I ask for your indulgence as I ponder the emotions that poured out of me that night. I am a happy guy. I'm successful by many standards. I have a well-paying job with a growing company. I have two fantastic, happy and well-adjusted daughters. I have a wonderful partner who I love and who loves me back. So why should a whimsical decision to return to hockey after so many years get my juices flowing like nothing else in recent years? There are many things I've done or left undone in life. Some because of outside circumstances and some because I was younger, less experienced and less disciplined. Most of those things can never be revisited or recaptured. You don't get a re-do on many of things that happen. As I've gotten older, I've gotten physically stronger and mentally tougher. While these traits aren't a substitute for talent they've served me well in my efforts to play competitive tennis. My opponents may beat me but I almost always out work them on court. This also helps me in business. I haven't risen to the ranks of a senior manager of a Fortune 500 company but I have been able to gain the respect of people I work for and work with. I can be a hard-nosed SOB when it comes to doing what I think is right. I am a competitor- more so as I've gotten older. "You don't get a re-do on many of things that happen." Taking the ice that night gave me an opportunity for redemption. Not because of a well of untapped talent that was squandered in my youth. I realized at a very early age I didn't have enough to become a prospect. But because I know in my gut that I never really fought very hard to get the most out of what I had when I was 14. Instead I resigned myself to simply being a participant and didn't exhibit the kind of metal toughness that would have resulted in a much better player. It's not about becoming something I should have been. It's about finding out what I am now and getting self-satisfaction for leaving everything out there today- something I didn't do back then. Don't most of us want that chance?